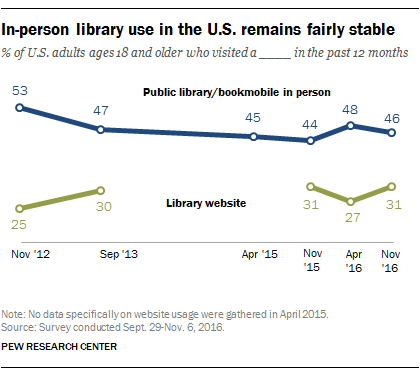 Across all generations, use of public library mobile apps is less common than use of libraries and their websites. The survey found that just 8% of Millennials used a library app in the past 12 months, as did 9% of Gen Xers and 9% of Boomers. Women are more likely than men to say they visited a public library or bookmobile in the past 12 months (54% vs. 39%). And women are similarly more likely to use library websites (37% vs. 24%). College graduates are more likely than those whose education ended with a high school diploma to use libraries or bookmobiles in the past 12 months (56% vs. 40%). And a similar gap applies to use of library websites. 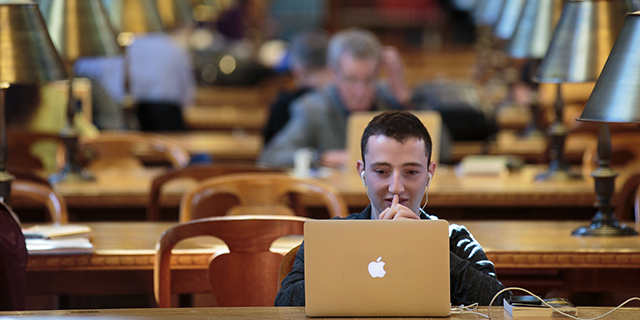 Read more about Americans’ specific engagement with libraries and library resources in a 2016 Pew Research Center report. Note: This report was made possible by The Pew Charitable Trusts, which received support for the project through a grant from the Bill & Melinda Gates Foundation. The findings and conclusions contained within are those of the authors and do not necessarily reflect positions or policies of the Bill & Melinda Gates Foundation.